August 2013 Dress! + New 'Special Edition'! 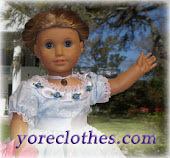 The 'Doll Clothes of Yore' August 2013 dress is now released! 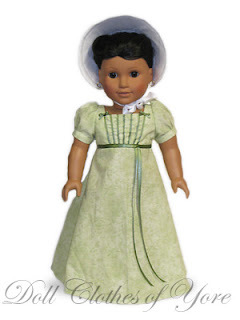 It's a gorgeous summertime Regency outfit, complete with a white bonnet that will match many outfits, not just this one! The 'Elizabeth Monroe' Dress - named for the fifth First Lady of the United States. 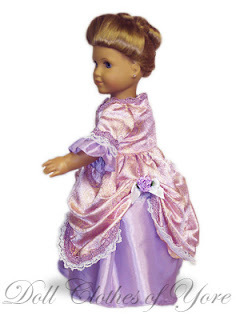 You can learn more about her and the fashion history behind the dress and bonnet on our website! Plus, we've got a new 'Special Edition' Dress - it's a remake of an older design, but still absolutely lovely! The 'Maria Theresa' Dress - It's a lavendar brocade beauty from the 1780's, the dusk of the Georgian era. Worn with the 'Colonial Undergarments' Set, it's a beautiful addition to any Colonial wardrobe! But don't wait - there are only 7 available.